It has a few minor scuffs on the sides and back, but these do not affect performance. Only the MP3 player is included. Works correctly, fully tested. NEW OLD STOCK Philips X Nike PSA110 Wearable Digital Sport FM Radio. Item is brand new Old stock. Has some shelf wear and a small spot of light cracking on the plastic case on the back. Very rare radio to find still in original packaging. You can playback MP3, WMA or DRM music from subscription services. It has FM radio with RDS and 20 presets for more music options. Simply drag n' drop your music or data via the USB connection. MP3 or WMA are two of the compression formats that let you enjoy a world of digital music on your GoGear player. Download MP3 or WMA songs from authorized music sites on the Internet or create your own MP3 or WMA music files by ripping your audio CDs and transferring them onto your player. 2GB Sport Version with case & sport headphones, 1" display, Full Sound, FM Radio, Voice Recorder, Songbird software. Item is unopened and sealed. Condition is New. 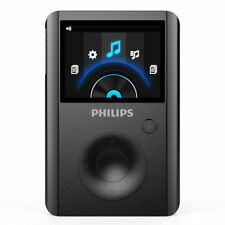 Philips 2GB Digital Audio Player is new . open box , minor damage to packaging due to storage. You can also use this as a voice recorder. Tested and everything works fine. The sound quality is nice and clear. Takes 1 AAA battery, not included. Brand New! Factory Sealed! Philips GoGear 2GB SA3020 Digital Audio Video Player 450 SONGS 800 PICS 4HRS NIB. Condition is New. SHIPPING FAST AND FREE! Philips GoGEAR Raga Black 2GB Digital Media Player bundle with sports cases. Condition is Used. Shipped with USPS First Class Package. Includes TWO sports cases. Does not include a charging cable. Condition is New. M P3 p la ye r withBluetooth headset. 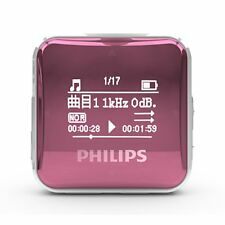 This Philips Go Digital Audio Player is New in Package. Thank you for your interest in this Item. Everything comes from a smoke and pet free environment. Shipping is always every week day and almost always on Saturdays. There is a 60 day money-back guarantee on all listings. Please message any questions, as they will be answered in a timely manner. Thanks for your time and confidence. Simply drag n' drop your music or data via the USB connection. This is typically not an issue if you have an established account that is linked to your credit card or bank account. Philips GoGEAR Black (1 GB) Digital Media Player MP3 recorder FM radio . Condition is Used. Shipped with USPS First Class Package. No Head phones only what's shown. Comes ready with memorable music! Thank you for your time. The original wrapping was taken off but everything is included and never used, mint condition. For sale is an original MP3 player released by Phillips. It has the Air Jordan logo. Comes with original armband only. Works perfectly as does the screen backlight. 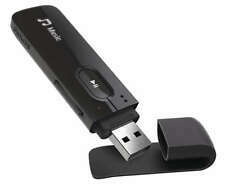 Comes preloaded with music but easily writeable with a USB cable. Free shipping to continental 48 states of USA. Feel free to ask any questions. Check my feedback and bid with confidence. Tested and works. In good condition. Minor signs of wear. Battery not included (1 AAA battery). See pictures and message me if you have any questions. 30 day money back guarantee on most my items. If you are not satisfied with your product, please contact me directly first. Please do not leave negative feedback, open a case, or contact me with a “item not as described” message. If there is any problem please follow these steps: 1. Contact seller 2. Select “I have a question about using my item or I want to send the seller a message”. 3. Describe your question. Customer service is my main goal, I am always willing to help make my customers happy if a problem arises. Thank you. Voice recording converts your GoGear player into a handy dictation machine. 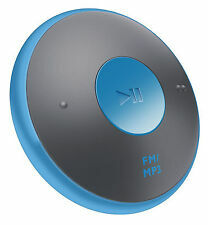 Enjoy MP3 and WMA music plus FM tuner. • High quality 5-band EQ with 10 audio settings. Simply download MP3 or WMA songs from authorized music sites on the Internet or create your own by ripping your audio CDs into MP3 or WMA files and transferring them to your device. You can quickly and easily copy your music collection from your PC to your player. Simply connect your player to your PC while in Windows® Explorer, select the songs or the folders that you want to copy to your player, then drag the selected files to the player's music folder. Philips GoGEAR FitDot MP3 Player 4GB -NEW IN BOX -Sports -Fitness -READ -PICS! Box shows wear. Box was opened to verify the contents which are all there. Full sound to bring your MP3 music to life. Enjoy more music with digital FM radio. 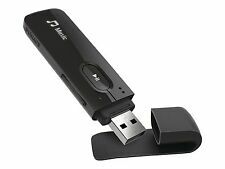 Fast downloads from your PC via USB 2.0.